U.S.-based Scientific Games Corp on Wednesday reported fourth-quarter revenue of US$823.0 million, up by 9.4 percent in year-on-year terms. The casino equipment maker and lottery services provider said the revenue increase was driven by growth in all its three business segments: gaming, lottery and interactive. “Gaming segment revenue increased 7 percent to a quarterly record US$492.5 million, driven by global shipments of 10,249 new gaming machines,” the Nasdaq-listed firm stated in a release. “Foreign exchange had a US$10.3 million favourable impact on [total] revenue,” it added. Scientific Games’ net loss for the fourth quarter declined to US$43.1 million from US$110.8 million in the prior-year period, “reflecting the improvement in operating income and a US$14.8 million decrease in interest expense,” the firm said. The net loss improvement was however partially impacted by a US$62.1 million decline year-on-year in tax benefit income. Scientific Games had already announced “selected preliminary expected financial results” for the fourth quarter on January 24. “Accordingly, we view the headline results [announced on Wednesday] as being largely immaterial from a stock action perspective,” analyst Carlo Santarelli from Deutsche Bank Securities Inc wrote in a note after the gaming supplier’s latest filing. The company’s operating income in the three months to December 31 increased to US$97.2 million from an operating loss of US$12.3 million a year earlier. Such performance reflected “revenue growth, a more profitable revenue mix, more effective business processes and lower depreciation and amortisation,” Scientific Games said. AEBITDA in the fourth quarter increased 10.6 percent year-on-year, to US$324.5 million. Attributable EBITDA margin improved to 39.4 percent from 39.0 percent in the prior-year period. Scientific Games’ full-year 2017 revenue increased 7.0 percent in year-on-year terms – or US$200.2 million – to US$3.08 billion. The net loss for the period was US$242.3 million compared with a net loss of US$353.7 million in full year 2016. “Our improved performance and strong future prospects enabled us to successfully refinance a portion of our capital structure in 2017 and 2018 that significantly lowers our cost of capital and increases future cash flow,” said Michael Quartieri, chief financial officer of Scientific Games, in comments also included in the firm’s results announcement release. Scientific Games completed in February a series of previously-announced financing transactions involving, among other items, the placing of a mixture of secured and unsecured notes. The firm said at the time that the net impact of the financing transactions would be to lower the company’s annual cash interest costs by approximately US$69 million. Total international shipments in the fourth quarter increased 290 units, or 7.0 percent, to 4,409 units, including 208 units for new casino openings, compared with 4,119 units in the prior year, which had included 404 units for new casino openings. Scientific Games did not disclose how many of the machines shipped in the fourth quarter were for gaming properties in Asia. 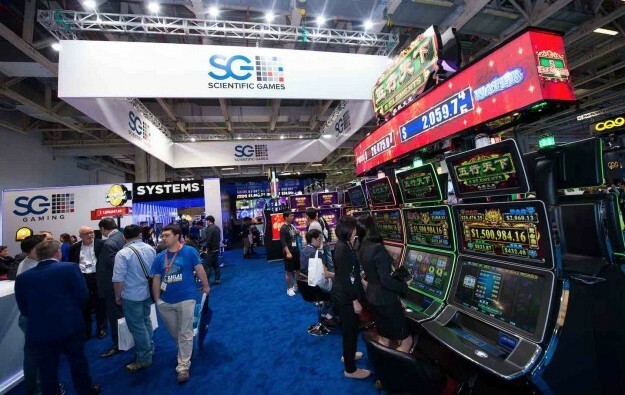 The average unit sales price for Scientific Games machines increased to US$16,858 in the three months to December 31 from US$16,268 in the prior year, “reflecting a more favourable mix of gaming machines,” the firm said. Revenue from sales of table products decreased US$4.9 million to $50.0 million, “reflecting a decline in sales of new shufflers and other table game products from the record sales level a year ago to casinos primarily in international markets,” Scientific Games said. Revenue from gaming operations also declined in the fourth quarter as measured in year-on-year terms, to US$169.2 million from 172.6 million in the same period in 2016.